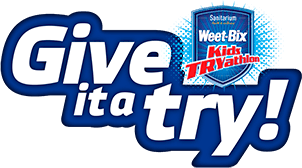 What is the Sanitarium Weet-Bix Kids TRYathlon all about? 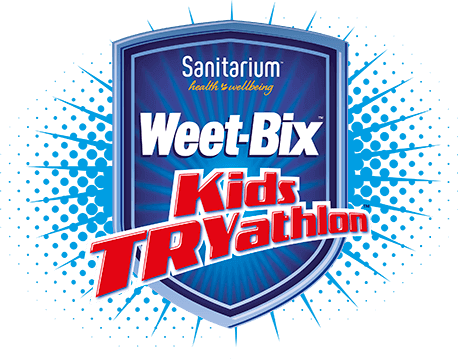 The Sanitarium Weet-Bix Kids TRYathlon helps kids stay active and healthy through a programme of participation. It’s about getting out there, giving it a TRY, achieving a personal best, improving confidence and self-esteem. Who can enter the TRYathlon? The event is open to everyone aged between 7 and 15, and consists of a swim, followed by a cycle and a run. Participants can enter as an individual and complete all three legs of the event or they can form a team of two by pairing up with a friend. As a team, one team member will be the “swimmer” and the other the “cyclist”. Both participants will complete the run section together. How much does the TRYathlon cost? Please note that these discounts are not available during the early bird discount period – the early bird discount is already the best price! The Early Bird discount cannot be used in conjunction with any other discount. Enter Now. What is the School Group Discount? If your child’s school has registered a school group at your event, you can receive a school group discount for your registration fee and help your school to win great prizes! You can join your school’s group either by completing a permission slip and returning this to your school group coordinator or by choosing to link to your school group when registering from home. If you are unsure if your school has a group, please enquire with your school’s sports coordinator. To register a school group, click here. What is the Multi-Event Discount? If your child wishes to participate in more than one event during the 2018/19 Series, you can receive a Multi-Event Discount of $4-off per participant. Please note that the Multi-Event Discount is not available during the Early Bird Discount period – the Early Bird Discount is already the best price! When filling out the online entry form for your second (or third!) TRYathlon event, you will be asked “Have you already entered into another TRYathlon event this 2018/2019 Series?”. Select “yes”, and the system will look for your participant name and date of birth in the list of existing registrations. If it finds a match, the Multi-Event Discount will automatically be applied to your entry fee. This discount is automatically applied at the checkout, and will reduce the registration fee for all subsequent events to NZ$…..(incl GST). Please note that you will need to have paid either the full early bird or full online registration price (ie. not used a discount or complimentary code) for your first event to qualify for a multi-event discount code. Can I get assistance with the cost of entering? You may be eligible for assistance with entry fees to the Weet-Bix Kids TRYathlon, or essential equipment you are missing that will enable you to take part in the event. 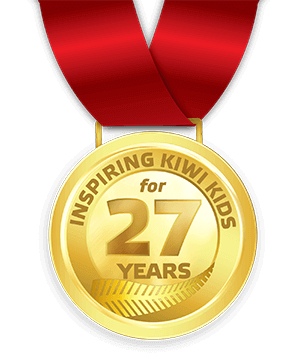 To find out more or to apply for assistance from the Weet-Bix Kids TRYathlon Foundation please click here. How do I get official photos of the event? Your child will need to be between 7 and 15 years of age on the event day which you are registering them for. You will also need a valid New Zealand credit or debit card to complete your registration. For health and safety reasons, each event has a limited capacity. Once this capacity has been reached, no further entries will be taken. Entry online is easy and payment can be made by credit card. Simply complete the information required and select the right options for you on each page as you click through. When you, as a parent or legal guardian, are registering your child online, please read the form and tick the box to agree to the terms and conditions. Following completion of the form and payment online you will receive a confirmation email to confirm your child’s registration. Call our Registration & Call Centre team on 0800 WEET BIX (0800 9338 249) if you wish to register over the phone. Participants who enter as an individual will complete the swim, cycle and run legs of the TRYathlon course. If you have 3 to 6 children in your family who wish to enter as individuals, you can enter them as a Family group to receive a discount for their registration fees. Participants may enter as a team of two – one as a team swimmer and one as a team cyclist. Both team members will complete the run together. It is important that both team swimmers and team cyclists bring closed in shoes for the run leg of the event. When registering as a team online or over the phone, both team members will need to be registered consecutively in the same session. The registration fees for both team members will be processed as one payment. If your child’s school has registered a school group at your event, you can join your school’s group either by completing a permission slip and returning this to your school group coordinator or by linking to your school group to receive the school group discount when registering from home. When do I need to enter by? Register prior to the courier cut-off date and have your race pack delivered to you before event day thanks to Post Haste! If you register after the courier cut-off date, you will need to collect your race pack on event day from the admin tent. Provided that the event capacity has not been reached, registrations will be accepted on the day of the event at the admin tent. Please note that on the day registrations will be charged full price. I have completed my child’s registration online – now what happens? Once your credit card payment has been approved, you will then receive a confirmation email from the Weet-Bix Kids TRYathlon. Please ensure that you check your junk mail if you have not received a copy in your inbox. You can contact the Registration & Call Centre on 0800 WEET BIX (0800 9338 249) if you have not received your confirmation within 24 hours of completing your registration. Make sure you keep a copy of this email as you will need to quote the reference number in all correspondence. You will receive two emails in the lead up to your event (one will be two weeks out and another a few days before the event) with specific details around your event including key timings, what to bring, what to do on the day, where to park etc. When will I receive my TRYathlete Kit? Thanks to Post Haste, all participants who register by the courier cut-off date will have their TRYathlete Kits delivered to them for free! If you complete your registration after the courier cut-off date for your event, you will need to collect your TRYathlete Kit on event day from the Registration & Pick Up Tent. To find the cut-off dates for your event, please visit the respective Location page. If you have registered prior to midnight on the Early Bird Delivery cut-off date, your child’s TRYathlete kit will be delivered to you by courier 10-14 days prior to the event thanks to Post Haste. If you have registered prior to midnight on the Standard Delivery cut-off date, your child’s TRYathlete kit will be delivered to you by courier 3-5 days prior to the event thanks to Post Haste. If you have registered after midnight on the Standard Delivery cut-off date, you will need to collect your child’s TRYathlete kit from the Registration & Pick-Up Tent on event day. Please bring a copy of your confirmation email with you to collect your TRYathlete kit. If you have paid to have your merchandise couriered, it will be sent separately from your TRYathlete kit. Orders will be dispatched from early November 2018 and going forward all deliveries will be sent within 5-7 working days from the date of your order. If you have selected to ‘pick up’ your merchandise at event please bring your order confirmation email with you on event day to the Merchandise Tent to collect your order. Your TRYathlete kit and merchandise orders will be delivered to the address you provided during the registration process. If you need to amend this address, please contact our Registration & Call Centre on 0800 WEET BIX (0800 9338 249). How can I train for the TRYathlon? TriNZ have a range of training programme guides for you to download and use as you prepare for your event. Check out TriNZ’s TRY TR@INER programmes here! What should I do before leaving home? Please read through the Preparation and On The Day Guides for your event to ensure you are well prepared and have packed all the items needed for a safe and fun day. These guides will be emailed out to you in the lead up to your event, and are also available to download from your Location page. Closed in shoes for the cycle and run legs (Asics Running Tips). A well fitting helmet for the cycle leg (Bike Barn Cycle Tips). Official Weet-Bix Kids TRYathlon t-shirt with bib number attached. Make sure you allow plenty of time to get to the event and to find a car park. Please leave enough time to get through the numbering, Check In and Transition process before Transition closes. The more time you allow, the easier it will be. There will be lots of people and it will be very, very busy, so please be patient and listen to all instructions, which will come from our officials, volunteers and the event commentator. To view the schedule for your event, visit the Location page. And remember, drink plenty of water before and during the event and always warm up and stretch before the TRYathlon! If the weather is not looking great on the morning of the event, make sure you check our Facebook page to check the event status. It is very unlikely that the event will be cancelled but it may change format from Triathlon to Duathlon, Aquathon or Fun Run. Safety is our first priority so adjustments to the format will be made as necessary. If there is a change to the event, we aim to have our Facebook page updated by 7:00am. Updates will also be broadcasted on your local The Hits station. Please check our event policies. My TRYathlete requires special assistance on the course. If your child needs assistance during any leg of the course, please contact our Registration & Call Centre at least one week before the event and we will discuss options with you. Do I need to go to the On the Day Entry & Pack Pick Up Tent? The On the Day Entry & Pack Pick Up Tent will be open between 8:00AM –9:15AM on week day events, and 7:00AM – 8:15AM on weekend events. You want to register ‘on the day’ for an event which has not sold out. You have not received a TRYathlete Kit. The participant t-shirt in your TRYathlete Kit is not the correct size. The participant bib sticker in your TRYathlete Kit has the wrong information on it. You need to make a last-minute amendment to a participant’s registration. Please bring a copy of your entry confirmation email with you to the On the Day Entry & Pack Pick Up Tent. Check In is the entry point into the Transition area and is open between 8:00AM – 9:15AM on week day events, and 7:00AM – 8:15AM on weekend events. You must Check In in order to complete the event. Will have your participant bib sticker barcode scanned. This enters you into the prize draw for Prize Giving! Be ushered to the correct row to leave your bicycle and gear in. Transition is a big fenced off holding pen for participants’ bikes and is the change-over point between legs of the race. When a participant comes from the swim, they will transition to the bike ride. When they finish the bike ride, they will come back to Transition to leave their bike and begin the run. The Transition area is organised according to swim cap colour. Bikes will need to be lined up with the flag matching your child’s swim cap colour and any additional equipment kept to the side of the bike. Once your child has gone through Check In and positioned their bike in the Transition area, you will not be permitted to enter Transition to add or retrieve equipment until after the conclusion of prize giving. Please ensure that you have everything you need for the day with you when you leave Transition before the event briefing. For a list what to leave in Transition, visit our On The Day guide. What time do I start my TRYathlon? The first TRYathlon will start at 10:00AM on a weekday event and 9:00AM for a Sunday event. TRYathletes will start their event in age groups according to their swim cap and bib sticker colour. Exact times for each age group will be communicated on the event day as these times will vary based on the number of participants registered into each event. Prize Giving begins once the final TRYathlete has crossed the finish line. Prize Giving typically begins between 12:00PM – 1:30PM, and has an average duration of 30mins. You must be present at Prize Giving to collect your prize if your name is drawn. Following the conclusion of Prize Giving, the Transition area will be opened for bikes and equipment to be collected. When will the event finish? The event finish time will differ based on the final number of participants registered into the event. Estimated event and prize giving finish times are likely to be between 12:00PM – 1:30PM. There will be a Lost Kids tent positioned next to the Admin Tent where our Help Team will care for any lost children – this is the best spot to find lost parents too! The first thing you should do when you arrive at the event venue is set up a meeting point. There will be lots of people there on the day and it will make it easier if you decide on a meeting place in advance that the whole family can go to if you do get separated and for when you finish your TRYathlon. We strongly recommend that you write your child’s event number on their right forearm and left shin. This is important as in the event of an accident it means we are able to identify your child and contact you via the mobile number you supply during the registration process. If you have other children with you on the day who are not participating, we recommend that you write your mobile number on their arm if they do not know it. What if I have lost property? If you have lost an item of property, we recommend that you check in at the Lost Kids Tent during the event and if it has not been handed in that you log the details of the item with one of the Help Team. Post event, please contact our Registration & Call Centre team at tryathlon@sanitarium.co.nz or on 0800 WEET BIX (0800 9338 249) as soon as possible with a description of the item. At the conclusion of each Sanitarium Weet-Bix Kids TRYathlon, all lost property is given to the local coordinator who will hold items for three months for collection. After this date any items that have not been collected will be donated to a local charity. The exception to this is any items that a child could use at the TRYathlon eg helmets, shoes, bikes and towels which will be donated to the Weet-Bix TRYathlon Foundation. The Sanitarium Weet-Bix Kids TRYathlon organisers take no responsibility for any property lost at the Weet-Bix Kids TRYathlon events. How far is the TRYathlon course? * 11-15 year olds will swim approximately 150m in locations where there are 25m pools (South Auckland, , Hutt City, Mt Maunganui and Dunedin) and approximately 200m in all other locations. The swim leg will take place either in the ocean or a public pool. Each venue is a little bit different, so we recommend you check the Location page to check the depth of the swim at your child’s event and to download a swim map. There are always lots of lifeguards on hand to help if your children need assistance. For pool swims, some of the lifeguards will be based in the pool for the entire event. Others will be located around the edge of the pool to assist with entering and exiting the water. Flutter boards are also available if required. All ocean swims are conducted parallel to the beach, so your child will never be far from land. Some of these lifeguards will stand on the shore and some of these lifeguards will be based in the water for the entire event. We will always have a lifeguard on hand for our TRYathletes should they require assistance. On the morning of the event, you will need to head to the blue CHECK IN tents at Transition to be scanned in. You will need to have your Weet-Bix TRYathlon t-shirt (with bib number attached), shorts, closed in shoes, towel and drink bottle in your Weet-Bix TRY drawstring bag (with your bib number written on it). This bag will be left with your team cyclist (not left in Transition) for them to give to you when you TAG them after the swim leg. Once you have TAGGED your team cyclist, you will have time to get dry and changed under the blue Teams Bay tents while your team mate is out on the cycle leg. Once ready in your running gear, you will wait for your cyclist to come and TAG you and then you will complete the run together. The cycle leg will take place in parks, on footpaths and roads with traffic management plans in place. We recommend you check the Location page for your event to download a copy of the cycle map. Each participant taking part as an individual or team cyclist, including children from the same family, will need to have their own bike and helmet to complete the TRYathlon. Sharing bikes can compromise safety and security. If you require assistance with equipment, you can apply for support from the Weet-Bix Foundation here. For health and safety reasons, closed in shoes must be worn during the cycle and run legs of the TRYathlon. On the morning of the event, you will need to head to the blue CHECK IN tents at transition to be scanned in and then leave your bike and helmet in transition. When you are ready to leave transition, you should be wearing your Weet-Bix TRYathlon t-shirt (with bib number attached) and your closed in shoes – that way you are all ready to go and just need to put your helmet on before you start cycling. Your team swimmer will give you their drawstring bag to hold on to while they are swimming. When they TAG you after their swim, you will need to give them their drawstring bag so that they can get changed while you are out cycling. The run leg will take place in parks, on footpaths and roads with traffic management plans in place. We recommend you check the Location page for your event to download a copy of the run map. 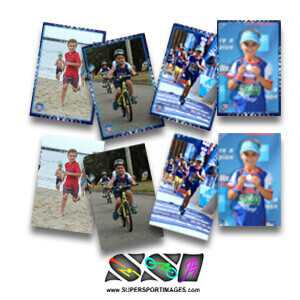 The Weet-Bix Kids TRYathlon is about participation and Fair Play. By entering the Weet-Bix Kids TRYathlon event, you agree to abide by the principles of Fair Play; respect for the rules, courtesy, just and equitable treatment for all participants, spectators and event volunteers alike. We also encourage all spectators, present on the day, to encourage and cheer for all participants present, and to equally abide by the principals of Fair Play. Thank you for your support. Participants and spectators must follow TRYathlon Marshals’ instructions. They will be the ones in the HELP TEAM shirts encouraging you and directing you around the course. Spectators must keep clear of all parts of the Weet-Bix Kids TRYathlon course. This includes the Transition Area, which, once the TRYathlon starts, will not be open again until after prize giving has concluded. Your helmet must be on correctly, and done up securely before you leave Transition. Closed in shoes must be worn for the bike and run legs of the event. You must ensure that your shoelaces are done up before you leave Transition. Take care on corners and slopes particularly if conditions are wet. Road closures are in place, keep left if not overtaking – remember that your bike course is like a normal road, and normal road rules apply. 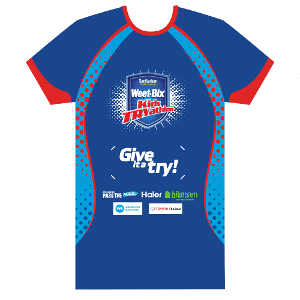 Your Official Weet-Bix Kids TRYathlon T-shirt must be worn during the ride and run. Familiarise yourself with the course – and view the maps on Information boards located in the event arena. Do NOT move other participant’s bikes or gear in the transition area at any time. After you have completed your TRYathlon you will receive an email with a link to our website where you can create and download your Certificate of Achievement. Simply type in the name of your TRYathlete and click ‘Download’ to save a copy of your certificate ready for printing. We are always keen to receive feedback on our events! After you have completed your TRYathlon you will receive an email with a link to complete a post-event survey.